I'd like to see a show of hands (a comment in the comment section will do). How many of you have given up a favorite cereal for the sake of trying to live an unprocessed life? Deliciously crunchy, addicting, and highly processed cereal. 1 bowl (for me, anyway) never felt like enough. Well folks, if you've ever been a Grape Nuts lover, this cereal is so spot-on, I will be surprised if it doesn't bring you back. After my first bite, I went back in time to standing in my college dorm room finishing up a little breakfast before starting my day of classes. Who would've thought?! I challenge you not to smile and chuckle with delight as you crunch your way through a bowl of this all-natural, nourishing, and unprocessed cereal. Enjoy! Adapted from More-With-Less Cookbook, by Doris Janzen Longacre. In a medium-sized bowl, whisk together the liquid and sourdough starter. Add flour and stir well. Cover the bowl with a tea towel and a plate and set aside for at least 8 hours. Preheat oven to 350 degrees Fahrenheit. Place two racks toward the center of the oven, and grease two cookie sheets. Sprinkle the baking soda and sea salt on top of the dough. Use a wooden spoon or a mixer to incorporate. Divide the dough onto two cookie sheets. Spread evenly to about 1/2 inch thick. Bake 20 to 30 minutes. Halfway through the baking time, rotate the cookie sheets. Remove from the oven and allow to cool slightly or completely, depending on your preferred method for grating (see below for grating options). Once the cereal is grated, spread the crumbles evenly on 3 cookie sheets. Bake at 250 degrees Fahrenheit for 45 minutes to 1 hour (depending on how crowded your cookie sheets and the size of your crumbles), stirring the crumbles and rotating the cookie sheets every 10 to 15 minutes. Baking time is complete once the crumbles are browned and perfectly crunchy. Cool and store at room temperature in a sealed container. Gluten-free? I encourage you to give this a try. You may want to add a tablespoon spoon or so of ground flax or chia seeds to the original batter — to help it hold together. No sourdough starter? Make it a soaked recipe by using 3 cups flour and 2 cups liquid that is either fermented or spiked with a few tablespoons lemon juice or whey. While still warm, tear into pieces and grate on a cheese grater. This is my preferred method. I find that the crumbles turn out just the right size. Feel free to experiment with your favorite food grinding/grating/chopping kitchen appliance! Have you given up a favorite cereal? I'd love to hear if this cereal brings you back! Where did you find yourself? Also see: Homemade Sourdough Cold Cereal (Dehydrator Method). I was never a fan of grape-nuts Kashi Go-Lean Crunch was my fav and what I have missed from time to time. My husband though really liked Grape Nuts so I may try this for him. Love the More with Less Cookbook! My mother had a copy that she used often. Thanks for the comment Jenny. 🙂 I’d love to hear how he enjoys it! Which type of wheat would you personally use? I just got my first grain mill and have soft white, hard white and hard red to start experimenting with. Very much a newbie, and I so miss cereals! Especially grape nuts, wheaties, and corn flakes! Oh! My! Goodness! EXACTLY like Grape Nuts, yet better! I used hard red, and soaked in whey. I tried my food processor on both the multipurpose s blade and then the grater, and I also prefer the grater. I just ground some more red wheat and have a double batch soaking! My kids are going to inhale this stuff! Hi Sarah- I know! Just like Grape Nuts! I couldn’t believe it when I first gave the recipe a try. I am so glad you enjoy it as well. Thanks for sharing your enthusiasm. Let me know if you give the sourdough version a try. Could you replace regular sourdough with brown rice sourdough and brown rice flour? Hi Helen- I’d definitely give it a try. Even if the first baked texture is different, you should still be able to crumble it and then bake/dry the crumbles. I’d love to hear how it works for you! Can you use kefir milk instead of sour dough starter? I have to be gluten free, so I don’t even know if you can make sourdough out of non-wheat flour. I make GF sourdough all the time. Many people use brown rice flour. I prefer a combination of oat flour and sorghum. Have you tried using a dehydrator? And I bake the crumbles for a little while then put them in the dehydrator till crunchy. Living in Georgia, the oven just doesn’t get it crispy enough. Thanks again. This is one of my favorite breakfasts. It is especially great for traveling. I meant 1 1/2 c dairy kefir. Oops! Amazing recipe! I LOVED grape nuts but stopped eating pretty much all breakfast cereal years ago. I tried this on a whim. I run a busy dental practice and have two kids so I’m crazy-busy. I started this on Sunday night, added salt and baking powder Monday and baked it. Left it on the counter and grated and toasted it on Tuesday. It’s WONDERFUL! Just like old times. Kim- Yeah! Your comment is a cherry on top of my day! 🙂 Thanks for letting me know how you liked the cereal. I love how you were able to stretch out the timing and make it work for you. Enjoy! I made this today using my gluten free brown rice sourdough starter, and a combination of quinoa and millet flours. The millet is a bit strong, but the cereal does have a nice nutty flavor, and will give me the flavor/texture that I’ve been missing. Thanks for sharing! I think I might try brown rice and buckwheat or buckwheat and quinoa next time. Thank you Erin for sharing this recipe! I haven’t had Grape Nuts for years; it was one of my favorites. I am looking forward to making this recipe! Thank you again. I just bought some sprouted flour. If I use it in this recipe do I still need to soak it ahead of time? Hi Laura~ Nope. No souring necessary. You could also give a non-sourdough version a try. No soaking, no souring necessary with sprouted flour. Let me know how it goes! I love this! 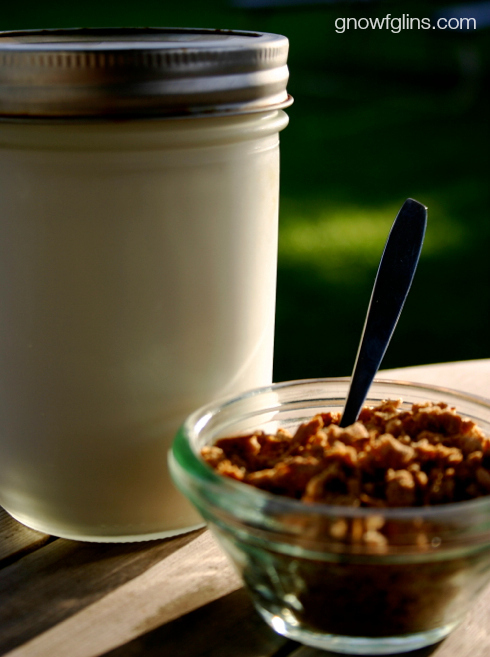 I’ve been keeping a big jar and using it for cereal, breadcrumbs and a base for my granola. Awesome! 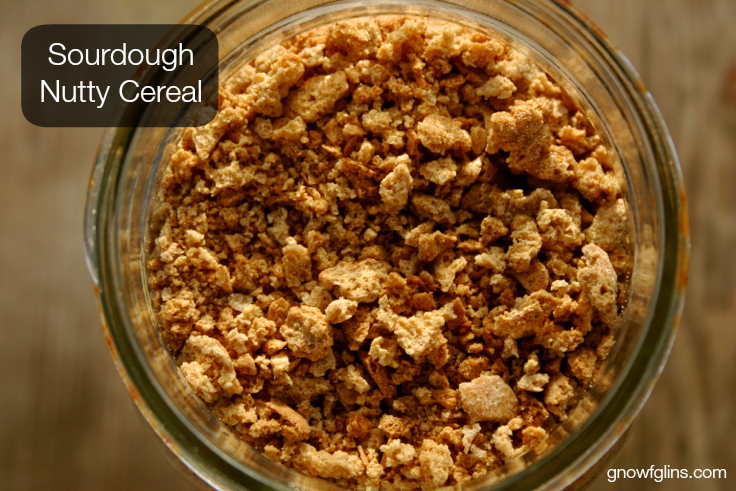 We love this sourdough cereal! There are ten kids in our family and we end up making three times the recipe for 1-2 breakfasts! I have even grown to like it and sourdough isn’t a favorite,(but loved this:) Thanks for this, it has done good with our choices in cereal! Hi Jade~ Yeah! So glad you are ALL enjoying the cereal. 🙂 Have you tried the sourdough cobbler by chance? I’ve been making that lately with our frozen rhubarb, raspberries, and cranberries. That’s another easy, tasty sourdough treat. Thanks for your comment!